I’ve eaten at over 500 places in NYC during my time living in Manhattan, and this is my guide to the best places to eat. I cover all price ranges, from cheap to very expensive (we’ve spent $800 on dinner a few times), and covering bakeries, ice cream, fancy dinners, sushi, and everything in between. Incredible food is undoubtedly one of the best parts about living in or visiting NYC. Some of the best food spots in the world live in this city, and the competition for creativity and food innovation is fierce. There are plenty of bad restaurants in this city too, but if you stick with the recommendations here, you’ll be in for some dang good food. Why should you trust my opinion? I realize that some people reading this might know me, while others might not. So I will say this: if you’ve ever been to a restaurant that had good Yelp reviews, but the food wasn’t very good, then there’s a good chance you’ve got some pretty high food expectations. So do I. All the restaurants and eateries in this post are the places that were exceptional and noteworthy enough that I returned to them again and again. Given that there are an estimated 24,000 places to eat in NYC, it says something that I’d go back to a place again instead of trying something new. In other words: There are many NYC restaurants I’ve been to that were good, but aren’t listed on this map or in this blog post, because “good” isn’t good enough. I have eaten at almost all of the two and three Michelin star restaurants in NYC, and most of the one Michelin star restaurants as well, and not all of them are worthy of a return trip. For example, places like Jean Georges and Uncle Boons were pretty good, but we don’t feel inclined to go back. Is it worth doing once? Sure. But it’s not on my list here because it’s a place I wouldn’t plan to return to. First, I recommend bookmarking or saving this post to reference from your phone during your trip to NYC. If you find yourself hungry while you’re out in a particular part of town, you can use this to see what’s closest, and I have found myself doing this too instead of trying to remember all the places nearby that I like. Below I share a short description of each place with favorite dishes, organized by category. I thought about including photos in this post but decided it would make it too long. Honestly, Yelp is a better place to look at photos of the food, since you can see a lot at once. Sometimes I do this before deciding whether or not to go to a new place, to get a sense of the food. Plating can say a lot! Also, you’ll notice that all of my food places are in Manhattan. I’ve eaten at some places in Brooklyn, Long Island City, and Queens, but not a ton. Yes, I’m biased toward Manhattan, but that’s because that’s where I’ve lived, and if you visit NYC, that’s where you are most likely to spend your time too. There are already way more restaurants on this island than I will be able to get to. 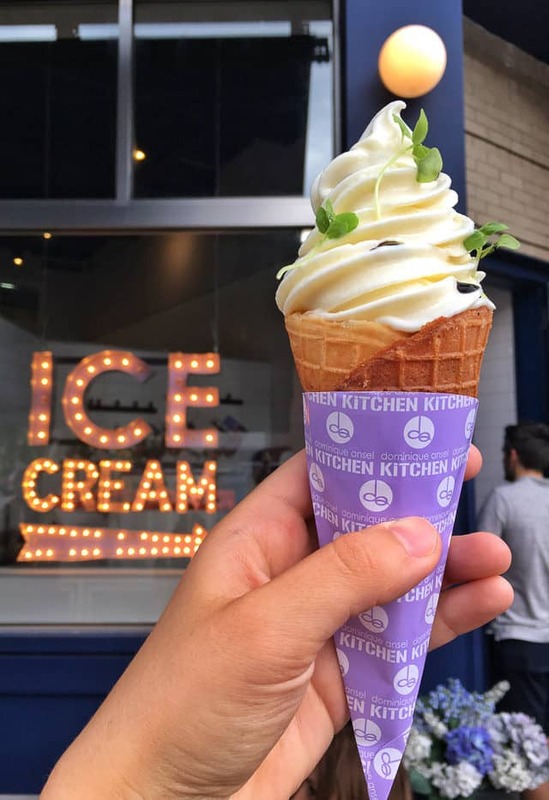 Chelsea Market, Eataly, Urbanspace Vanderbilt, or other food halls – Make sure to visit at least one food hall or market in NYC (see my full list below). I think Chelsea Market and Eataly are the most interesting for tourists, and they’re the biggest too. Now let’s dive in to all the places on my food map. These are in no particular order, just how my Google Map lists them. Also, nothing in NYC is actually cheap, so by “relatively cheap” I mean it’s the cheapest category of all my restaurants in this post. Check menus for pricing if you have a particular budget. These are in no particular order, just how my Google Map lists them. Here’s what I mean by “Medium Expensive:” These are all nice places to eat, and places you should probably dress up somewhat nicely at, and dinner will be pricy, but not the $200-$300/head that some NYC restaurants are in the next category. These are in no particular order, just how my Google Map lists them. Some of these are very expensive, but are worth trying once if you want a really memorable meal that’s more than just food, but an experience. These are in no particular order, just how my Google Map lists them. I’ve tried a lot of sweets in NYC, many of which had two hour lines that I feel weren’t deserved (like that cookie dough place…sorry, but no) and these are the absolute best in my opinion. NYC has SO many incredible food halls and markets of varying sizes, stuffed with high end casual eateries and food spots. If you like food, then visiting a few of these during a visit is a must. I’m partial to innovative cocktails, and Pete likes craft beer, so that’s most of what’s listed here. Phew! That was a long post. If you have any questions about any of these places in particular, leave a comment below and I will reply. Happy eating! I am so glad I had your map when our family visited NYC this summer, thank you! NYC is so very delicious! Thank you so much for the information. My wife and I will be visiting in December. Of the very expressive restaurants you listed is there one or two that you would put ahead of the rest? How high are you willing to go with pricing? Some of them are around $300/person, which I know some people is too much for how they’d value a meal. Ko and EMP are both great, but several hours long, and very pricy. For still incredible experiences for a little less, I love Jungsik and The Modern. Don Angie is also a great experience, a little less fine dining, but amazing food.